Did you know that in the years between 1990 and 2004, almost 250,000 miles of rural roads simply vanished? That over those same 14 years, nearly half-a-million miles of urban roads were created? And did you know that, as a percentage of gross domestic income, the nation's transportation outlays in 2004 decreased to their lowest levels of the past decade, 11.5 percent? If you weren't aware of those statistics, you can be forgiven, because, until now, you haven't been able to read the one publication that reveals those numbers and hundreds more. 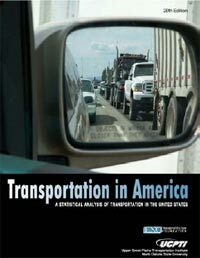 But, with the release of the 20th Edition of Transportation in America , all that is about to change. What began half-a-century ago as a time- and labor-intensive effort to create a practical statistical snapshot of the state of the railroad industry, has, through the march of time and the rise of computers, emerged in 2007 as the 20th edition of Transportation in America . From 18 boxes of papers, compiled in the 1950s, and filled with hand-calculated data supplied by the Interstate Commerce Commission and the American Association of Railroads, TIA has evolved into a masterwork of transportation industry analysis. Breaking with five decades of tradition, TIA 's 20th edition offers 21st century data drillers, as well as casual readers, the best of both worlds: clear, easy-to-comprehend charts and graphs, and a veritable cornucopia of exacting tables covering everything from the waterfront (U.S. Port Rankings by Cargo Volume) to the railways (Railroad Intermodal Traffic Volumes), to the highways and skyways (Domestic Small Shipments of Major Carriers). Credit for this new edition can be allocated in equal parts: The vision of the Eno Transportation Foundation's President and CEO, Tom Downs; the enthusiastic commitment of the Foundation's Board of Directors; invaluable source partnerships with more than three dozen industry corporations, associations, individuals, and federal agencies; and the resources of the Upper Great Plains Transportation Institute of North Dakota State University. As the grandson and son of Union Pacific Railroad workers, and as an REA bag handler in high school. Tom Downs remembers when train yard inventories, the industry's basic database, were largely managed on paper, by people walking through the yard actually writing down the contents and destination of the waiting cars. Freight allocation decisions were made based on hand-processed data. It was a model unchanged for more than half-a-century. It was also a model challenged by trucking and air freight haulers employing faster, more efficient models of package movement through the use of computers and outmoded by the emergence of radio frequency interference chips (RFIs) and global positioning satellites (GPS). The new data management technologies were allowing industries willing to adopt them the ability to make quantum leaps in the efficiencies needed to grow businesses, improve customer services, and hold costs to absolute minimums. And managing data is what Transportation in America is all about. Eno's mission was to overhaul TIA , break with tradition, and apply a new formula for data collection, analysis, and presentation that would meet the expectations of the data providers themselves. Eno envisions a new TIA with a reliable baseline, easy-to-understand text and graphics for readers interested in industry snapshots and big picture trends, and more comprehensive datasets to satisfy industry analysts and researchers. Setting the baseline at 1990 meant that all previous years' data would be relegated to archival status. "Consistency is critical to such a large endeavor," Downs said. "At some point you have to set an agreed-upon jumping off point for all that will follow, and by starting with 1990, we were able to build a very consistent picture of the state of transportation year by year." Key to building the new TIA was to begin with a foundation of timely and reliable data from as many transportation sources as possible. To that end, the Eno Transportation Foundation called on transportation industry leaders in every possible field: rail, aviation, highway, small package shipping, intermodal, intercity, urban transit, waterways, construction, pipelines, banking, and government. Ultimately, the list stretched to more than forty sources of transportation data, economics, advocacy, and federal oversight. With new information swelling their inboxes and emails, Eno called on a trusted partner to manage the numbers and prepare the publication. Eno's partnership with the Upper Great Plains Transportation Institute at the University of North Dakota resulted in a perfect marriage of raw gigabytes of data and world-class numbers wizards who excel in the analysis and explanation of transportation information. Tom Jirik, UGPTI's communications director, described the Institute's approach to TIA . "Our goal was to build on the reputation that the Eno Foundation had established" said Jirik. The UGPTI team focused on the needs of two distinct audiences: technical readers who are interested in the depths of the data, and lay readers who represent government, financial institutions, trade association, and the general public. "The book has a reputation as an excellent resource, and the researchers who compiled this edition did an excellent job of building on that reputation while updating and enhancing the information available. We tried to make the layout and design reflect that. Our focus was to make it attractive, understandable, and reader friendly." The next step, according to Tom Downs, is a period of critical review and comment by TIA 's readers. "We want to know how useful this edition is," said Downs. "All comments, good and not so good, are welcome and encouraged." Once the Eno Foundation digests the response to this newest edition, they will move forward to publish an electronic, disc- and web-based version, which is planned for release within the next two years. In TIA , Eno illustrates both its great respect for our nation's transportation past as well as its high regard for its future. From the Conestoga wagon to Clipper ships to cargoes in the sky, transportation is the lifeblood of American society. It always has been and always will be.